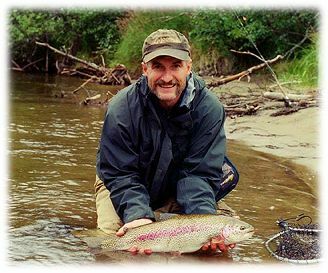 Matsu Valley streams in Alaska produce fine fly fishing for resident rainbow trout such as this prime example. Bob Woolsey must be thinking, "wow, I can't believe I kept this one out of the snags." By late summer, the rainbows around south-central Alaska are big, brute strong and willful. Over generations, they've developed a standard routine for survival that works. When hooked, jump 6 times then head for the deepest water with the most snags. If that doesn't work, jump some more, and then head in the other direction. Wearing the angler out is their most favored tactic. Nice fish Bob.